I’ve just finished reading Edmund Morris’ splendid biography The Rise of Theodore Roosevelt. I can’t remember how I got interested in this book, but I came away from it greatly appreciative of Roosevelt not only as a great President but as a man whose capacity for both thinking and doing were almost superhuman. Although some aspects of his life seem questionable to me (there’s a distinct subordination of his family life to his career, for instance), I do admire his voracity of mind, his passion for public service and for doing what’s right, and the sheer force of his personality in getting things done. That’s a daily schedule that will turn a few heads. On the other hand, all you have to do is substitute “A speech” with “Teach class” and the word “telegram” with “email” and you have a pretty close fit to the modern educator’s school day. What stands out to me is not so much the sheer frequency of speaking engagements TR had (is this close to what Obama and McCain do today?) but what surrounds those speeches and discussions. Do you see it? It’s reading. This schedule includes 4.5 hours a day of it. And it’s not just memos or strictly political works, but fiction, science, and so on. To me, there are at least three deep lessons to learn from this. First, making time for personal growth during the day, especially the growth of the intellect, is extremely important. Educators make their living by expending intellectual energy. You cannot continue to expend energy indefinitely without fueling back up somehow, if you expect to last long. This is very easy to forget, as we see the sheer amount of stuff in our inboxes and begin to think that if I just had one more hour, I’d get that much more stuff done and be that much happier. But I think — and perhaps TR thought as well — that happiness can also come from having time to make sure you get fed yourself and not just spend all your time feeding other people. Second, this time for personal/professional growth can be structured in bite-sized chunks. Look at TR’s schedule again. His reading times average just 45 minutes each, split evenly between three half-hour time slots and three one-hour time slots (the longer ones coming outside the usual work day). In the past, I’ve tried to schedule in these inviolable times for reading and research, but only in single, monolithic, 3-hour long slabs happening once a week. That approach has never worked out for me. So as I think about making time in my busy schedule for reading and writing, maybe the more realistic approach is to take frequent, small chunks of time in which to do it. Surely I can afford 30 minutes a day, right? I probably waste that much time each day checking emails I don’t need to see. Third, this time for personal/professional growth benefits from a kind of happy diversity. TR was reading whatever interested him, regardless of whether it pertained directly to being the Vice-President or not — ornithology and Walter Scott along with everything else. Personal/professional growth time ought to include, for me, not just mathematics but also new things — say, computer programming, biology, history, and so on. You never know exactly what is going to pertain to your job, and the most pertinent thing for your job if you’re a teacher is a well-rounded, active, happy mind. So I take some encouragement from this little bit of history, that the most effective thinkers and doers from our past had schedules that were even more insanely busy than mine, but never suffered from burnout or lost their passion and drive for what they do — because they took time to feed themselves and grow themselves just as they fed others and helped them, and their country, to grow as well. Thanks for sharing TR’s schedule. Pretty impressive… I’m guessing that his speeches were not the same speech over and over the way a candidate does a stump speech, but on several different subjects. He must have been very skillful at thinking on his feet. Imagine GW Bush in this scenario…. impossible. Or Obama without a teleprompter. Did you see Obama’s hour long interview with Rick Warren? He does just fine without a teleprompter. McCain did better than I expected as well. One area in which Roosevelt was late to the party was on votes for women. During his time in power, he opposed votes for women. When he was trying to get back into the White House – he saw that women could and would help him – so he supported suffrage. Thanks to the suffragettes, women now have voices and choices the women who lived during his presidencey could not have even dreamed of. Most people are totally in the dark about HOW the suffragettes won. There are tons of heartache for these heroines on the rocky road to the ballot box – but in the end – they WIN! Presented in a unique sequential e-mail series — each inspiring episode is about 10 minutes — perfect to enjoy during coffeebreaks, or anytime. True – one of the strange disparities in TR’s life was his seemingly selective approach to individual rights. He was quite ahead of his time in treating Blacks as equals, but seemed to consider everybody else, including women and especially Native Americans, as being of inferior stock. somehow. Thanks for the historical note. Interesting, Teddy was governor for less than 2 years, was known as a ‘Trust Buster”, loved the Outdoors and had many children. 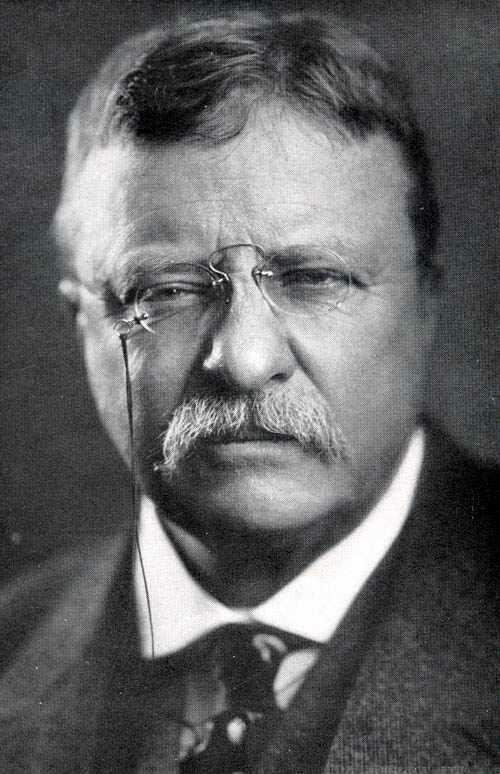 Is this Teddy Rosevelt you were discussing or Sarah Palin? Sounds like Sarah is as qualified as Teddy was. I’m a McCain/Palin supporter, but I do have to say that despite the similarities, TR had a lot more experience entering office than Palin has now. He was an Assistant Secretary of the Navy who really did most of the work of the actual Secretary of the Navy; Police Commissioner for NYC (a huge job given the corruption at the time); Civil Service Commissioner for the USA; and was a NY state representative before that. Again, I’m pulling for Sarah Palin, but I think it’s important not to make too much of some of the similarities we see. TR biggest issues were deadbeat dads, abandoned women and bringing the law down hard on men who abused women. This made much more of a difference for the everyday woman than voting would have. TR also shocked many by allowing a woman to go to the electric chair for the first time in history. How’s that for equality?